At 61 stories and over 740 feet, Four Seasons Private Residences One Dalton Street, Boston will become the city’s tallest residential building. Designed by world-renowned architect Henry N. Cobb, the all-glass tower is shaped as an equilateral triangle with rounded bays and floor-to-ceiling windows that feature wrapping views of the Back Bay skyline, the Charles River, Fenway, South End and beyond to Boston Harbor and the Blue Hills. The 215-room Four Seasons Hotel will occupy the first 23 floors, with the 160 luxury condominium residences comprising the upper floors. One Dalton will include the finest amenities the city has to offer, including on-site parking garage with valet services, a fine dining restaurant with bar and lounge, state-of-the-art fitness center, 65 foot lap pool and signature spa and salon. Exclusive resident amenities include a private residential lobby with doorman and concierge services and owner’s Club Lounge on the 50th floor designed by legendary architect and designer Thierry Despont, as well as a theater room, golf simulation room, yoga studio, and family activity center on the 24th floor. 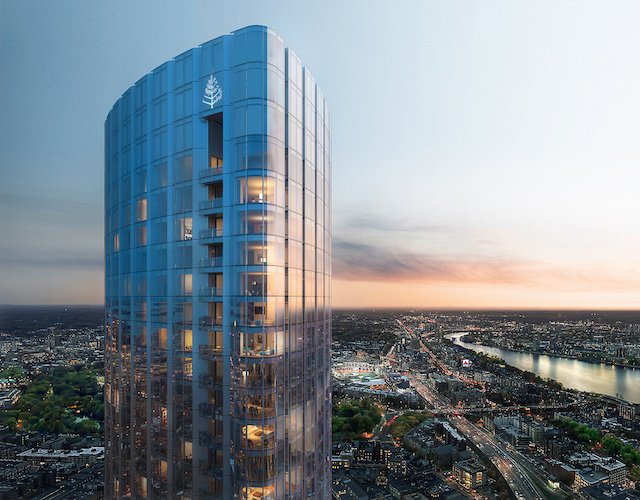 The luxury building will become Boston’s third tallest structure overall, behind the 750-foot Prudential and the 790-foot John Hancock Tower, both office buildings. Hancock Tower architect Henry N. Cobb is designing the new project along with Cambridge 7 Associates. The development of the property, formerly owned by the First Church of Christ, Scientist, includes the construction of a public park at the base of the building designed by famed landscape architect, Michael Van Valkenburgh, as well as a 26-story apartment tower on an adjoining parcel to be built by Pritzker Realty Group of Chicago. Designed to be a landmark building, Four Seasons Private Residences One Dalton Street, Boston will forever change Boston’s skyline. The Official Groundbreaking Ceremony took place on January 14, 2015.